Mick appeared on the April 11 airing of the BBC’s Old Grey Whistle Test television program. While he performed three solo numbers including Play Don’t Worry and Angel No. 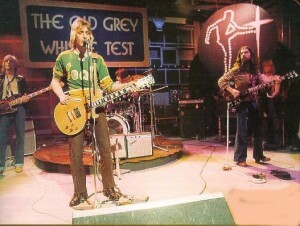 9, backed by John Turnbull on guitar, Geoff Appleby on bass, Blue Weaver on keyboards and Jim Toomey on drums, the slot was originally booked to promote the Hunter – Ronson collaboration about to kick of in the United States. Ronson filled in as a solo artist when Hunter found it necessary to return to the US before the scheduled appearance. I saw Mick in Glasgow in either 1975 or 1976. Were you on that tour, if so I can add you to the list of greats I’ve seen without realising it? This ‘long lost’ footage has been uploaded on youtube. As has the unaired take 1 of ‘Play Don’t Worry’. The photo above looks like it was from rehearsals for filming as Mick’s changed outfit for the filming that was broadcast – and changed amps too it would appear. Made my decade seeing this footage! The footage will be shown at The Mick Ronson Legacy event on June 4th 2011 at The Springhead pub in Hull, UK. Hi there, I contacted Bob Harris show crew some years ago to see if the footage was available. But had no luck. It would be great to see it. He’s wearing the same yellow and green top as when he signed an autograph for me in Birmingham, England. I really wish there was someone out there that had a copy of this. I’ve been trying for sometime to track a copy down but without success yet. Is it possible to see this performance anywhere????? So, just by chance Ronno found himself in the limelight, that’s great!